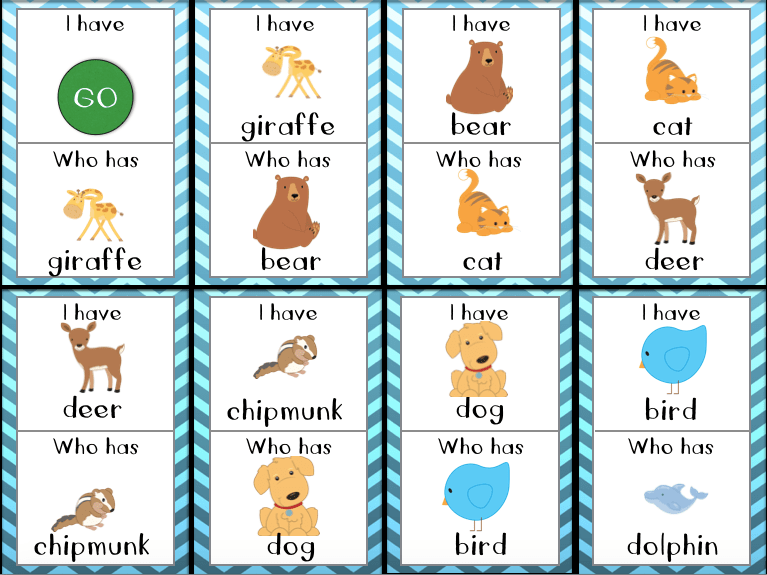 “I Have, Who Has?” is one of my favorite secret weapons for the classroom. This game can cover almost any material that you are covering curriculum-wise, from letters of the alphabet in K, to division in third grade. It seems to be loved with equal enthusiasm by four-years-olds and ten-year-olds alike. In kindergarten, it can produce an excitement as if you have presented the class with the other “best things ever”—like personal whiteboards, Where’s Waldo books or a pile of shaving cream. I especially love this activity for Kindergarten because it reinforces so many important classroom habits. In order to play, students must be: listening, ready to take turns, and prepared to speak to the group with a loud voice. Any fun way to practice patience is golden in the K classroom. I write this just after the near miss of an accidental haircut because one of the kiddos had such a hard time waiting their turn to ask a question about their scissors. So, patience is important, and can be a learned skill. Each child receives a card. On the top is the object/word/number/math equation/etc. that “I have…” The bottom of the card shows “Who has” and another object/word/number/math equation/etc. The child with the card that says “I have go” starts, and they take turns by following the sequence of the cards. The last child’s card will have a “Stop” on the bottom, so everyone knows that the game is finished. Laminate your cards. You can use the same games over and over again to practice a skill. If you want to start and stop on different cards than the one’s designated “Go” and “Stop” in the set, simply put a dot sticker or an Avery label over the top or bottom portion of other cards to make them “Stop” and “Go” cards. This is especially helpful if you have fewer kids than cards, or if you just want to switch it up. Just be sure to keep the rest of the cards in order so you still have a game that works in sequence. You can also work up to giving each child two cards if you have enough cards in your set, or when using the game in a small group. Just model for your kiddos that after one of their cards is called, turn it over so that it is face down on the carpet in front of them, so they know they used it already. You can check in with each student as you pass out the cards to ensure that they know the “I Have” and the “Who Has” so they do not get tripped up when it is their turn. This animal freebie is the set that I like to use in the very beginning of the year in order to get the rules of the game down. Each card has a picture of an animal as well as the word for the animal on both the top and bottom. This is helpful for your students who do not know how to read yet. This activity can be scaffolded later to include cards that have pictures and words, or just words. I use this set in morning meeting or closing circle. Later, different sets can be used for math fluency word, during literacy, or even other academic or social-emotional portions of the day. Enjoy!